Add this to the list of reasons Venus is a blistering hellscape: not only is the surface hot enough to melt lead, not only will the sulfuric acid rainstorms burn gaping holes in your partially-melted spaceship, it’s got a monstrous electric wind that appears to have helped strip all the water out of the atmosphere. Good luck gardening in your cloud city. Scientists have long suspected that all planets with an atmosphere also have an electric field, generated by a layer of charged particles in the upper atmosphere called the ionosphere. But so far, on every planet where we’ve looked, including our own, we’ve been unable to detect it. The working theory is that these electric fields are very, very weak—Earth’s is thought to be in the range of one to two volts. Venus is different. “Venus’ electric field is enormous—it’s a monster lurking in the sky,” said Glyn Collinson, lead author on a study published today in Geophysical Research Letters which used data collected by the ESA’s Venus Express mission to measure that electric field for the very first time. Venus’ electric field is at least five times larger than that of Earth, Mars, or Saturn’s moon Titan. It’s so strong, in fact, that it produces its own “wind,” which is less like the gusty gales we’re familiar with on Earth and more akin to the solar wind, a stream of charged particles emanating from the sun. This discovery could help explain why Venus contains a minute fraction of Earth’s water, despite being formed from similar starting materials. When sunlight hits molecules of water vapor in the atmosphere, the jolt of energy causes them to break apart into ions of hydrogen and oxygen. 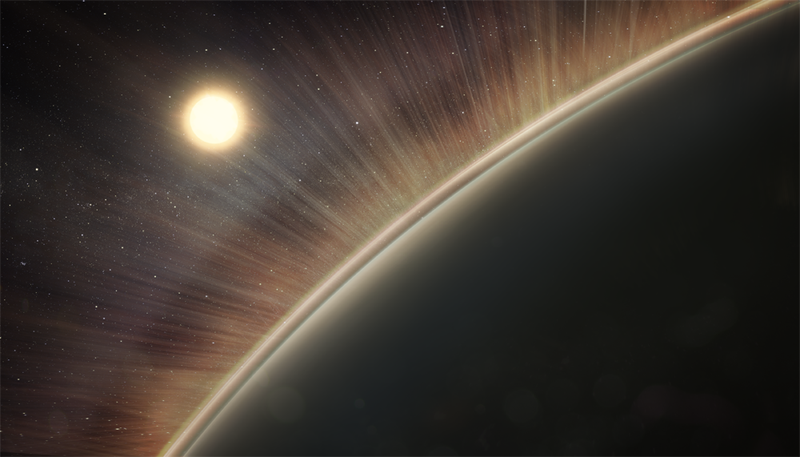 On Venus, the electric wind is strong enough to accelerate those oxygen ions to atmospheric escape velocities. “If we want to strip the atmosphere, we need to overcome gravity,” Collinson said. Now, we have mechanism for doing exactly that independently of the solar wind, which is typically implicated in atmospheric stripping. But if a rocky, habitable-zone exoplanet turns out to have a monstrous electric field, would it really be Earth-like? Or would it be more like Venus? Collinson’s interests lie a bit closer to home. He’s a collaborator on NASA’s MAVEN mission, which is currently orbiting Mars and collecting troves of data on the Red Planet’s upper atmosphere. MAVEN researchers would like to measure Mars’ electric field, which, despite being weaker than that of Venus, may also play a role in atmospheric stripping. “All the models say this is incredibly important at Mars, but now we have to detect it,” Collinson said. Personally, I can’t help but hoping for an extremely weak electric field at Mars. That rust-bucket needs all the help it can get holding onto its thin atmosphere—especially if we humans want to terraform it. If we can’t, we may be forced to revisit the idea of a floating habitat on Venus. Any takers?